NEW HAVEN, Connecticut (Ticker) - Amelie Mauresmo did her part to set up a marquee quarterfinal at the Pilot Pen tennis tournament. Lindsay Davenport soon followed suit. Mauresmo rallied for a 4-6, 6-1, 6-2 victory over Russian qualifier Galina Voskoboeva in a second-round match Wednesday at the $1.275 million co-ed event. The top seed in the $600,000 Tier II women's draw, the Frenchwoman also is seeded first at next week's U.S. Open, where she hopes to become the first woman since Serena Williams in 2002 to win three Grand Slams in a year. In Thursday's quarterfinals, Mauresmo will face the seventh-seeded Davenport, who dispatched Italian Francesca Schiavone, 6-4, 6-2, later Wednesday afternoon. Davenport, who has missed much of the season with back problems and a concussion, is 4-0 all-time against Mauresmo at this event. Mauresmo and Davenport are the only seeds remaining in the top half of the draw after fourth-seeded Russian Nadia Petrova was upset by Marion Bartoli of France, 4-6, 6-4, 7-6 (7-4), for her fifth straight defeat. Bartoli will face Australian lucky loser Samantha Stosur in the round of eight. Third-seeded Russian Elena Dementieva bested Slovakian Daniela Hantuchova, 6-2, 5-7, 6-0, to set up a quarterfinal clash with fifth-seeded countrywoman Svetlana Kuznetsova, who beat her to win the 2004 U.S. Open title. In a night match, No. 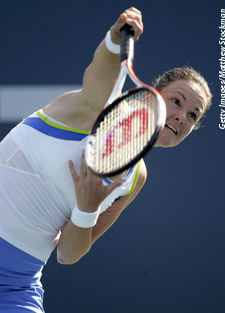 2 Justine Henin-Hardenne of Belgium defeated Anabel Medina Garrigues of Spain, 6-4, 6-2. Henin-Hardenne has reached the final of all three majors this year, winning the French Open between losses to Mauresmo at the Australian Open and Wimbledon. The Belgian will face Italy's Mara Santangelo in the quarterfinals. The lucky loser advanced in a walkover Wednesday morning when China's Na Li could not play due to a right ankle sprain. Eight third-round matches are on the docket in the $675,000 men's event. Second-seeded Nikolay Davydenko of Russia routed No. 16 Paradorn Srichaphan of Thailand, 6-4, 6-1. He next will face eighth-seeded Olivier Rochus of Belgium, a 6-4, 6-3 winner over No. 9 Gael Monfils of France. Austrian lucky loser Jurgen Melzer held a 6-4, 4-1 lead over Fernando Verdasco when the seventh-seeded Spaniard retired with a right ankle injury. Melzer next will play No. 15 Robin Soderling of Sweden, who outlasted No. 3 Marcos Baghdatis of Cyprus, 6-3, 6-7 (3-7), 7-5. Tenth seed Agustin Calleri of Argentina routed fifth-seeded Spaniard David Ferrer, 6-3, 6-1, and next will play 14th-seeded Chilean Nicolas Massu, a 6-3, 6-4 winner over No. 4 Jarkko Nieminen of Finland. Also in the top half of the draw, 12th-seeded Argentine Juan Ignacio Chela beat sixth-seeded countryman Jose Acasuso, 7-6 (7-1), 6-2. Chela awaits No. 13 Xavier Malisse of Belgium, a 6-1, 6-3 winner over Spaniard Ruben Ramirez Hidalgo, who upset top seed and defending champion James Blake on Tuesday night.